It's almost Halloween, and Lily wants to make the perfect costume for trick-or-treating.But every costume she makes is too scary, too flouncy, too glittery...too something. All this trial and error keeps her two cuddly kittens guessing -- until Lily finally has a brilliant idea. Will this costume be the perfect Halloween surprise? The soft, orange-hued drawings done in pencil, watercolor, and gouache are appropriate for the season and full of activity as the industrious little girl goes to work. Children will enjoy the Lily’s imagination and the reactions of her kittens as she creates several costumes from materials she finds around her house. The just-right size of the book; plentiful white space; and large, clean font make this a good choice for beginning readers. A cheerful addition to Halloween collections. Sweet little Lily’s quest to come up with just the right costume is characterized by quietly entertaining do-it-yourself determination. Unsure what she should be for Halloween, Lily consults her attentive kitties, Fluff and Frisky, as she considers each potential costume. “ ‘How about a ghost?’ / Too scary!” But her imagination keeps on working. Readers see her try out being a pirate, pumpkin, ballerina, gypsy, princess and robot. Each is unsatisfactory and “too…” something: mean, clumsy, jangly, etc. Here Alley truly enhances the text with full-page pictures that burst with Lily’s exuberant musings. Young ones will have fun guessing and chiming in with the crafty little heroine as she deliberates each new idea. Of course, none of these costumes are good enough, and time is running out. Lily looks to her feline friends and “knew just what she wanted to be.” Soon she is decked out and ready to surprise Daddy—here the last spread unfolds—“Meow.” Cozy, muted colors in watercolor and gouache are given delicate detail with pencil. As in Demas’ earlier Valentine Surprise (2008), Lily’s plucky dedication to solving her own dilemma reinforces the lesson to keep trying and do your best. Upbeat, independent, and creative, Lily makes a very likable heroine, and her question of “what to be” is the classic Halloween dilemma. A sequel to Demas and Alley’s Valentine Surprise (2008), this colorful picture book features a simply written story and witty illustrations with considerable child appeal. Lily, who first appeared in Valentine Surprise, returns for a homey Halloween. As she tries on costumes, two expressive kitties get dressed up, too. But nothing seems right: a ghost is too scary, a pirate is too mean, a ballerina is too flouncy, and a robot is too bulky. Finally, a flap reveals her “purrfect” costume. Alley’s airy pencil, watercolor, and gouache spreads, rendered in soft autumnal shades, should stir up anticipation for trick-or-treating and provide some costume ideas, too. 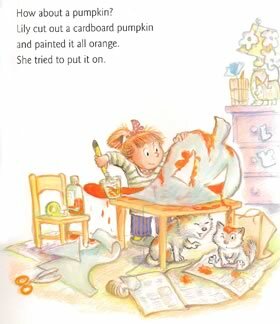 Introduced in Valentine Surprise, Lily returns in this delightful picture book that follows her dilemma in deciding what to wear for “trick-or-treat...The ingenious child finds the inspiration for her clever costume right in her own household. It just took her awhile to figure out what would really be a cute get-up!...Young children will love Halloween Surprise and its excellent illustrations. Everyone can relate to the quandary of deciding what to wear on Halloween - and, as you’ll discover, sometimes the simplest idea is the best. Ask for it at your local library. Buy it at your local bookstore. R.W. Alley has illustrated nearly a hundred books for children, including Valentine Surprise and the beloved Paddington series. He lives in Rhode Island. You can visit his web site at www.rwalley.com to learn more about him and his books.